Do you enjoy spending time with friends and family in your garden or maybe dream of an outdoor wedding or birthday party? Are you the lucky owner of a mobile catering business? For whatever reason you’re here, buying a gazebo will protect you against sun and rain while having plenty of space to move around. We’ll start with the reviews of some great gazebos the UK market has to offer. At the end of the reviews, we listed a few things you need to consider before buying. Available in many different colours, this heavy duty gazebo can be considered virtually indestructible. The steel frame is sturdy and resistant to rust, comprising of 24 different support struts made from metal. Besides, there are no wind bars required, rendering this gazebo long-lasting. The 260 g/ m2 PVC coated roof is waterproof, making this is a great gazebo for rainy days. The 30 x 30 mm legs are reliable too, and the whole pop-up design renders this gazebo easy to set up. You can also easily take it down, considering you don’t need to take the roof off the frame. With such sturdy materials, this gazebo reaches 26 kg, which is fairly heavy. If you’re using the 4 included leg weight bags, the overall weight reaches 40 kg. Although that means this All Seasons isn’t great in terms of portability, its sturdiness means more stability. Another advantage consists from the useful extras. The carry bag is resistant, manufactured from the same sort of polyester as the canopy. There is a care guide too, as well as a 1-year warranty for the frame and parts. However, the instructions manual could be a lot clearer. Yet again, this Airwave pop up gazebo comes in five different colour shades you can choose from. The canopy is manufactured from 190g polyurethane, which is waterproof, therefore leak free in rainy conditions. The pop-up design makes it easy to set up, without fear of losing parts. The steel frame is sturdy, and the hexagonal shape ensures increased stability. The sidewalls included can be arranged any way you like, and offer good wind protection. There are four with windows and two with zippers and tie backs, so this gazebo is fairly practical. On the other hand, the windows are made from plastic, so don’t rely on them in the long term. The Velcro side attachments aren’t the best design addition, making this gazebo look a bit saggy. However, the wide anchor foot connectors are another practical addition. They enable you to set this gazebo up on various sorts of terrain, from soft grass to patios and concrete. The guy ropes and pegs included make the gazebo very secure, and are also easy to adjust. The push-button connections are another advantage when it comes to its fast assembly, considering they are fitted to the sliding connectors. The extras included are one carry bag and the 1-year warranty. Among the entire outdoor gazebos reviewed here, this Coleman is hands-down the best for camping or events. The reason is that it can easily be packed, and it’s fairly compact, albeit not that light at 17 kg total weight – but that contributes to its stability. Apart from its portability, the shape of this gazebo is great for camping, considering that it provides optimum ventilation with its curved arches. This also makes effective in high winds on the market, especially if you use sturdy tent pegs and stretch the fabric tightly. There is also good ventilation provided through the roof and a wide shade area. The Coleman UVguard has a high SPF (sun protection factor) 50+ protection against UV rays, and can easily face quick summer showers. However, the flysheet used for the canopy isn’t as resistant as polyester, so remember to store it away only when it’s dry. The other materials are quality too: the rust-resistant powder-coated steel frame and the PVC plug connections for extra-security. There are also holes in the feet to add tent pegs if you want to increase its stability, which are good perks for a fairly affordable gazebo. This Checo product is the best permanent gazebo for people who hate taking down their gazebos every night or once the warm season is over (especially thinking about its massive size). Besides, considering that all the elements are pressure-treated with Wolmanit, this will behave just fine in the winter. The pine/ spruce wood used to manufacture this gazebo doesn’t rot and isn’t affected by the weather, so it’s perfect for setting up your hot tub, for example. The huge 600kg weight of the gazebo makes it hands down the best against high winds – it would literally take a tornado to bring it down. The design is great for any garden event and the ventilation is great thanks to its legs design. The colour is a warm, dark brown, which makes it quite stylish. The pack comes equipped with all the necessary materials for setting it up, including decorative board bolts and screws. However, just like most wooden gazebos, this product is considerably expensive, with the downside that it doesn’t include roof shingles in the pack. With its rich coffee colour, this Greenbay Gazebo may be great for garden parties. Its wide dimensions mean it will accommodate a large crowd, and the 49kg weight provides stability in windy conditions. However, this gazebo requires fixing to the ground. The canopy is manufactured from 180g polyester, coated with PA and therefore resistant to rain and UV rays. There are drain holes in the roof, extremely useful so the accumulated rainwater doesn’t rip the canopy fabric. The 2-tier design is functional and stylish at the same time, and the removable sidewalls are great for extra wind and sun protection. The good quality of this gazebo stems from its materials and how sturdy the final product is. For instance, the support tube and frame are made from steel, with 8 ribs that provide extra support to the canopy and the hot-air taped construction is another plus when it comes to the resistance of the seams. It will take a while to set it up, but once you do – good value for money. 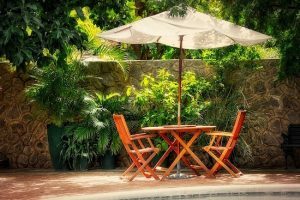 When you’re looking for a good garden gazebo, you might need it to offer you some degree of protection against pesky mosquitoes. The good news is that this Horwood Gazebo does, courtesy of its net curtains that close with zippers, so they don’t let any annoying bugs in. The frame is made from steel, which allows extra-stability and support even when it’s windy. The canopy is made from 180g PA-coated polyester, which is water-resistant. However, the net curtains aren’t waterproof, and the anti-pool drainage allows water inside this gazebo. Still, this is one of the best cheap gazebos on the market. It looks stylish too, with its combination of dark frame and beige canopy. The design is functional: it has a stable hexagonal shape, there’s a wide shade area and holes in the feet so you can secure the gazebo to the ground. Besides, the pop-up design means you can set it up in minutes, although the size and weight might require more people for the job. With a huge footprint and shade area, the Quictent party tent is great for large get-togethers. Besides, considering its waterproof nature and great UV protection, this gazebo is ideal for big events that can’t be postponed because of the weather, like weddings or flea markets, for example. On the other hand, some water might leak through the side-panel stitches if it’s raining cats and dogs. If you have any other functional problems, this gazebo has reliable warranties, which contribute to its steep retail price. The weight of this thing is huge, so you need more about three people to set it up. But that’s because of the huge size, decagonal shape and sturdy materials. The frame is made from powder-coated steel that’s rust-resistant, while the corner joints and base are metal. The PVC-coated roofs, doors and windows are resistant to tears, as well as water. Besides, the 8 removable sidewalls and 2 zipper doors provide good protection against the elements but allow for ventilation at the same time. The best materials used for gazebos are polyester for the canopy, and metal or wood for the frame. The thicker the polyester fabric, the more protection you’re getting against the elements. As for the frame, steel and aluminium are very hardy, but wood is the best for permanent gazebos. A gazebo with a large marquee is great for bigger events and more shade. However, this might make it difficult to set up, with more people required for the job. A big size, along with the quality of materials, also adds to the overall weight. If you want a permanent gazebo or even a very sturdy one, you can expect it to weigh a lot. On the other side, a camping gazebo should be fairly lightweight. There are various things to consider when it comes to design. For instance, if you need your gazebo for elegant events, its colours have to be stylish, with no net curtains or other cheap, plasticky-looking materials. The shape is important too. More poles add to the overall stability, which is why hexagonal or even decagonal shapes work great for large gazebos. Think about how you assemble it too. A pop-up design is useful for camping or if you’re not that good at setting up tents with lots of parts. However, pop-ups might not be extremely resistant, though they’re portable and easy to store. All gazebos should offer good protection against the elements, but what that means depends on your purpose and geographical area. Now is a good time to take into account the materials used. Polyester offers some UV and rain protection, but completely waterproof gazebos or with a 50+ SPF should have a special coating. A sturdier, metal frame based on 6+ poles can protect against winds, but the best against inclement weather are permanent gazebos. Otherwise, make sure your gazebo has air vents for ventilation and feet holes to secure it to the ground. Among the extras you can consider are things that make your life easier, like an easy-to-read instructions manual, storage bag and great warranties. Other extras offer protection against the elements. Sidewalls and doors work against wind and rain, net curtains protect against mosquitoes and flies, while weight bags offer more stability. 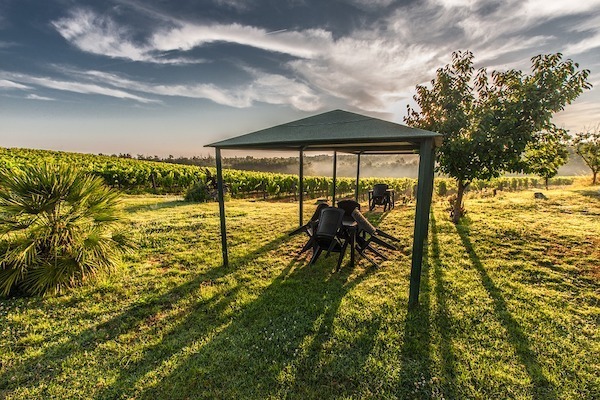 We’ve taken you through a series of reviews, navigating through pop-ups and permanent gazebos, from wooden to portable, from the best gazebos for wind and rain to reliable gazebos for winter. Some of them are small, some of them are large, some of them are affordable while others are more expensive, but these are all the quality and popular. Which one did you like, which one you didn’t and have you ever used a gazebo before?